A few months ago, I started attending a prenatal yoga class one evening a week. It’s a different kind of class in that we share tea and conversation following our yoga practice, and much of the conversation, as one might imagine, revolves around pregnancy, child-rearing, and general mom concerns. It’s a lovely time for these women to connect with others who are facing similar experiences, whether first-time motherhood or negotiating the waters of second/third-time parenting. In the first class I attended, I did share that I had a child who died. It seemed appropriate because we were asked to share whether we had other children, but I didn’t say more about it. At the next class, over twice as many women attended, and I chose not to share my story. I didn’t pretend to be a first-time mom, but I didn’t bring up my son dying of leukemia either. So when it came time for our tea and conversation following the class, and a woman was struggling with getting her nearly-three-year-old son to sleep, I wasn’t sure what to do. I had advice, experiences to share, and I wasn’t sure whether to share them as though I had a living child or to stay quiet lest I bring up my son who died and inadvertently shift the focus to myself. I sat and nodded in recognition of her plight, and eventually, our teacher noticed and said, “Timaree, it looks like you know something about this.” It was an invitation. I shared from the experience I had of a child who preferred not to sleep, all while staying focused on the mom, avoiding my own story, pretending if for a few minutes to be one of these second-time moms, even though it felt a bit foreign. Every time I think of that moment, I tear up. Since Caemon died, Jodi and I have wanted to “get back” to parenting. We were just getting started when he got sick, just finding our groove. 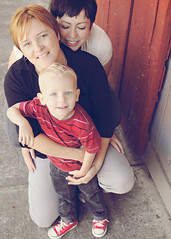 We loved being the moms of a curious little boy; it was such a singular joy, our primary focus. When he died, not only did we lose our beloved son, but we also lost this enormous piece of our identities. People reassured us we were still mothers, and in our hearts, we felt we were, but we didn’t live the lives of mothers. We haven’t for two years and five months. There have been no bedtimes to negotiate, no meals picked over by four- or five-year-old hands, no loads of small clothes to wash or toys to put away, no scraped elbows to kiss or hurt feelings to hug away. Mothering Caemon has turned to remembering, longing, grieving. Here we are, though, less than a month away from meeting Caemon’s little sister, and all signs point to us getting back to parenting. But what does that mean for us? We won’t be starting again where left off—and I think for a long time that’s what “getting back” to it meant for us: reading the books we had just discovered with Caemon, repeating our favorite family inside jokes, making muffins on a lazy Sunday while our son tried to lick up all the batter; it meant getting back to mothering the boy we knew so well. It has taken months for me to grasp that getting back to it is really starting over—starting with a whole new little person, a whole new perspective of parenting, and in that, there is both joy and grief, anticipation of the new and longing for the familiar—always this duality of emotions. As this pregnancy has progressed, I have met other expectant parents—some of them first time moms, some experienced parents with small children to consider—and I simultaneously identify with both sets and none of them at all. I have all the “luxuries” of being pregnant and preparing for a newborn without parenting another child. My wife and I can spend quality adult time together, I can nap whenever I like, I can be as lazy or as productive as I like because I don’t have a living child to consider. But because I am not a first-time parent, I have the wisdom of experience, the serenity of knowing I don’t have to worry about swings and bottle warmers and having the perfect nursery, of knowing that birth doesn’t have to be scary, and more importantly, that we can do this. Then there is the other side of it all. We have hand-me-downs from big brother–toys, clothes, his precious books—without the big brother attached. There will be no wondering where Caemon should spend the night while we are at the hospital, no first meeting of brother and sister, no little boy jealous of the time his moms spend with the new baby, no watching two siblings loving each other as only siblings do. Coupled with that I have so many of the fears of a second-time mom: the guilt of giving my thoughts and love over to another child, of feeling like I’m somehow neglecting my first child for the other—of forgetting the little details about my son: how he smelled, how his cheek felt under my lips when I kissed him good night, how his laughter rang throughout our home. I worry I won’t love my daughter enough, that she won’t know the best of me, that she’ll always be trying to access that part of me who died with Caemon. I suppose some of my worries aren’t unlike those of second-time parents at all; I just happen to parent a first child who no longer walks this earth. He was my first love as a mom, and he always will be. Certainly I will love his little sister. Certainly I will continue to love him. I am not getting back to the parenting I once knew, but I am rejoining the world of mothers of living children. I am growing a little girl in my belly who is likely to split my heart wide open again, who will remind me of her brother in some ways and in most ways will be her very own being. I am soon to meet this soul who will indeed welcome me back to the most treasured role I have ever held. I have her brother to thank for showing me the world through a mother’s heart; I have her to thank for bringing me home again. This entry was posted in Uncategorized and tagged bereaved parents, Caemon, Caemon's Legacy, pregnancy after loss on July 4, 2015 by T.
So much love to you ladies. This little dancer is lucky to have such thoughtful, insightful parents. I am looking forward to the new lady joining us earthside. Welcome back. Have missed you and continue to keep all of you in my prayers. Thank you so much for sharing! Wow – Welcome back… what a beautiful message! I was holding Caemon in my heart the other day when a little 1 1/2 year old I am working with now was very scared of the vacuum cleaner, even when it was off. So we made a plan and made friends with it. We gave it a name and dressed it up and played with it. Caemon’s life lesson about making friends with your fears has stuck with me so very much and I think he would have been tickled to see me and a toddler playing dress up and dancing with the Vacuum cleaner, which is now our friend, named Sho Sho. I’m looking forward to hearing about your new parenting adventures with baby girl! A heart felt post. Thank you for sharing this. So joyful to hear you’ll be expecting Caemon’s little sister around the same time as I’ll be expecting Anderson’s little brother. This pregnancy has been so bittersweet – I completely get that. A restful and stress-free last few week to you! Thank you for sharing this beautiful news! I hope the rest of your pregnancy is smooth as can be. Beautifully written, as always. Welcome back indeed. You and J are going to be just fine this time around. If anyone knows what this motherhood thing really is all about, it is you. I am looking forward to witnessing the parts of the journey you choose to share. Thank you. Normal is a moving target and there is never any “going back.” You are looking forward and bringing with you beautiful and precious Caemon. The best of luck and joy. Well, I can relate coz I experience this a lot nowadays. My son didn’t die, but he was taken from me & in a sense it’s a similar loss as I don’t see him at all in any way. I’ve recently found myself wrestling w/ wanting to be called a father again & to get to know how it feels again; to “get back” to parenting as it were. I’ve read this post many times, been so very happy for you both yet aware of the element of bittersweetness. For some things I struggle to find words, the depth and heart of this post is one of those things. Just know I care so very much. I wish you a gentle birthing, and a joyful meeting with your precious daughter. -Our blog header was created by the wonderful graphic artist Lynnette Nees. In Her Image Photography .